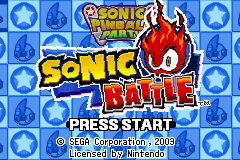 2 Games in 1: Sonic Pinball Party & Sonic Battle, called Double Pack: Sonic Pinball Party & Sonic Battle (ダブルパック ソニック ピンボール パーティ＆ソニック バトル) in Japan, is a compilation of two Sonic games for the Game Boy Advance. It contains the games Sonic Pinball Party and Sonic Battle. There are no extras, just a menu that lets you select the two games. On emulation websites the European ROM is being labelled as "2 In 1 Sonic Pack Vol 2". The in-cartridge cheats and unlockables from the original games still work, however the game enhancer codes do not. Their respective cheat pages can be found here: Cheat Codes: Sonic Pinball Party and Cheat Codes:Sonic Battle. This page was last edited on 28 April 2017, at 16:48.